1. This Directive aims to harmonize national measures concerning the management of packaging and packaging waste in order, on the one hand, to prevent any impact thereof on the environment of all Member States as well as of third countries or to reduce such impact, thus providing a high level of environmental protection, and, on the other hand, to ensure the functioning of the internal market and to avoid obstacles to trade and distortion and restriction of competition within the Community. 1. This Directive covers all packaging placed on the market in the Community and all packaging waste, whether it is used or released at industrial, commercial, office, shop, service, household or any other level, regardless of the material used. 2. This Directive shall apply without prejudice to existing quality requirements for packaging such as those regarding safety, the protection of health and the hygiene of the packed products or to existing transport requirements or to the provisions of Council Directive 91/689/EEC of 12 December 1991 on hazardous waste ( 8 ). 1. ‘packaging’ shall mean all products made of any materials of any nature to be used for the containment, protection, handling, delivery and presentation of goods, from raw materials to processed goods, from the producer to the user or the consumer. ‘Non-returnable’ items used for the same purposes shall also be considered to constitute packaging. (c) transport packaging or tertiary packaging, i. e. packaging conceived so as to facilitate handling and transport of a number of sales units or grouped packagings in order to prevent physical handling and transport damage. Transport packaging does not include road, rail, ship and air containers. The definition of ‘packaging’ shall be further based on the criteria set out below. The items listed in Annex I are illustrative examples of the application of these criteria. (ii) Items designed and intended to be filled at the point of sale and ‘disposable’ items sold, filled or designed and intended to be filled at the point of sale shall be considered to be packaging provided they fulfil a packaging function. 12. ‘voluntary agreement’ shall mean the formal agreement concluded between the competent public authorities of the Member State and the economic sectors concerned, which has to be open to all partners who wish to meet the conditions of the agreement with a view to working towards the objectives of this Directive. 3. The Commission shall, as appropriate, present proposals for measures to strengthen and complement the enforcement of the essential requirements and to ensure that new packaging is put on the market only if the producer has taken all necessary measures to minimise its environmental impact without compromising the essential functions of the packaging. 2. Packaging waste exported out of the Community in accordance with Council Regulations (EEC) No 259/93 ( 9 ), (EC) No 1420/1999 ( 10 ) and Commission Regulation (EC) No 1547/1999 ( 11 ), shall only count for the achievement of the obligations and targets of paragraph 1 if there is sound evidence that the recovery and/or recycling operation took place under conditions that are broadly equivalent to those prescribed by the Community legislation on the matter. 10. Member States which have, or will, set programmes going beyond the maximum targets of paragraph 1 and which provide to this effect appropriate capacities for recycling and recovery shall be permitted to pursue those targets in the interest of a high level of environmental protection, on condition that these measures avoid distortions of the internal market and do not hinder compliance by other Member States with this Directive. Member States shall inform the Commission of such measures. The Commission shall confirm these measures, after having verified, in cooperation with the Member States, that they are consistent with the abovementioned considerations and do not constitute an arbitrary means of discrimination or a disguised restriction on trade between Member States. 11. Member States having acceded to the European Union by virtue of the Accession Treaty of 16 April 2003 may postpone the attainment of the targets referred to in paragraph 1(b), (d) and (e) until a date of their own choosing which shall not be later than 31 December 2012 for the Czech Republic, Estonia, Cyprus, Lithuania, Hungary, Slovenia and Slovakia; 31 December 2013 for Malta; 31 December 2014 for Poland; and 31 December 2015 for Latvia. 1. The Council shall, in accordance with the conditions laid down in the Treaty, decide no later than two years after the entry into force of this Directive on the marking of packaging. 2. To facilitate collection, reuse and recovery including recycling, packaging shall indicate for the purposes of its identification and classification by the industry concerned the nature of the packaging material(s) used on the basis of Commission Decision 97/129/EC ( 12 ). 1. Member States shall ensure that three years from the date of the entry into force of this Directive, packaging may be placed on the market only if it complies with all essential requirements defined by this Directive including Annex II. The Commission shall promote, as appropriate, the preparation of European standards relating to the essential requirements referred to in Annex II. 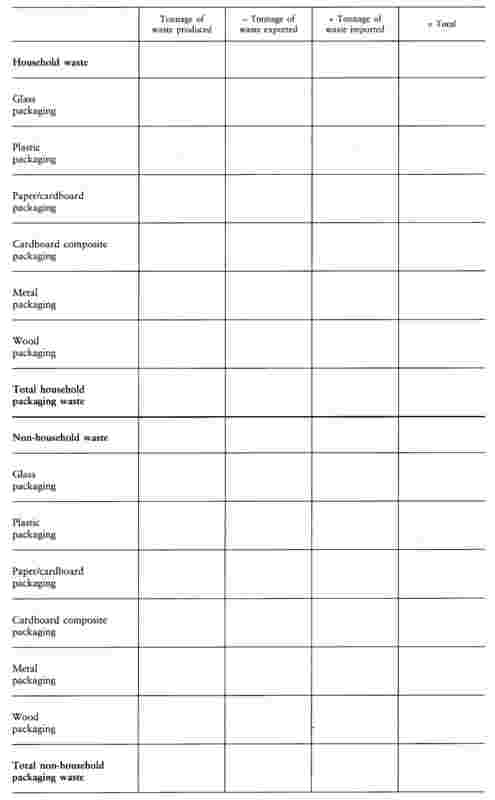 — criteria for the marking of packaging. — 100 ppm by weight five years after the date referred to in Article 22 (i). 2. The concentration levels referred to in paragraph 1 shall not apply to packaging entirely made of lead crystal glass as defined in Directive 69/493/EEC ( 13 ). — the types of packaging which are exempted from the requirement referred to in paragraph 1, third indent. 1. Member States shall take the necessary measures to ensure that databases on packaging and packaging waste are established, where not already in place, on a harmonized basis in order to contribute to enabling Member States and the Commission to monitor the implementation of the objectives set out in this Directive. 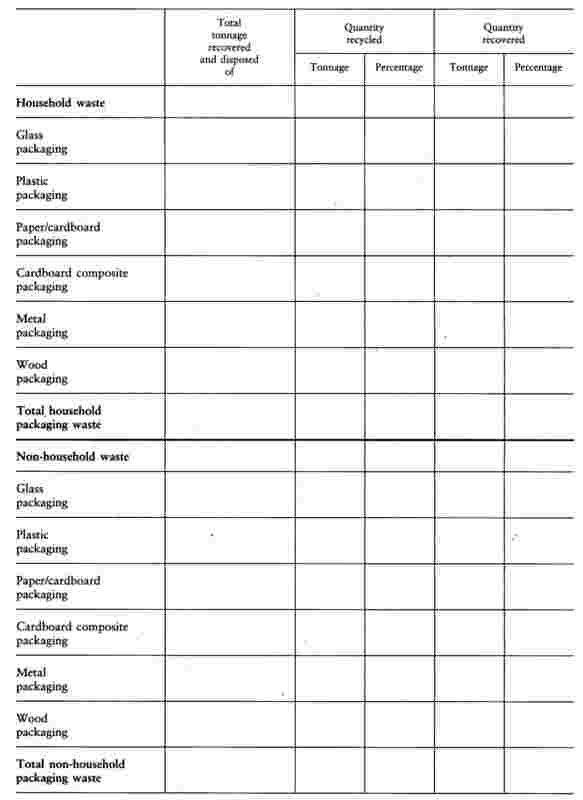 — the appropriate elements of the management plans for packaging and packaging waste as referred to in Article 14. Member States shall also promote consumer information and awareness campaigns. 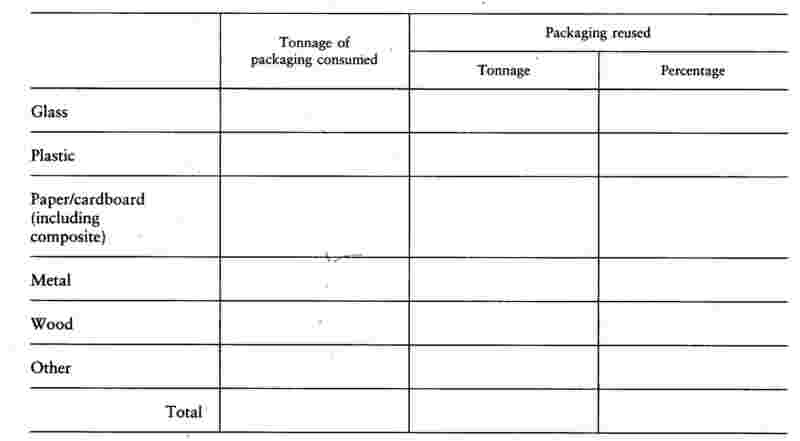 In pursuance of the objectives and measures referred to in this Directive, Member States shall include in the waste management plans required pursuant to Article 17 of Directive 75/442/EEC, a specific chapter on the management of packaging and packaging waste, including measures taken pursuant to Articles 4 and 5. Acting on the basis of the relevant provisions of the Treaty, the Council adopts economic instruments to promote the implementation of the objectives set by this Directive. In the absence of such measures, the Member States may, in accordance with the principles governing Community environmental policy, inter alia, the polluter-pays principle, and the obligations arising out of the Treaty, adopt measures to implement those objectives. 1. Without prejudice to Directive 83/189/EEC, before adopting such measures, Member States shall notify the drafts of measures which they intend to adopt within the framework of this Directive to the Commission, excluding measures of a fiscal nature, but including technical specifications linked to fiscal measures which encourage compliance with such technical specifications, in order to permit the latter to examine them in the light of existing provisions following in each case the procedure under the above Directive. Member States shall report to the Commission on the application of this Directive in accordance with Article 5 of Council Directive 91/692/EEC of23 December 1991 standardizing and rationalizing reports on the implementation of certain Directives relating to the environment ( 14 ). The first report shall cover the period 1995 to 1997. Member States shall not impede the placing on the market of their territory of packaging which satisfies the provisions of this Directive. The amendments necessary for adapting to scientific and technical progress the identification system (as referred to in Article 8(2) and Article 10, second subparagraph, last indent), the formats relating to the database system (as referred to in Article 12(3) and Annex III) as well as the illustrative examples on the definition of packaging (as referred to in Annex I) shall be adopted in accordance with the procedure referred to in Article 21(2). 1. 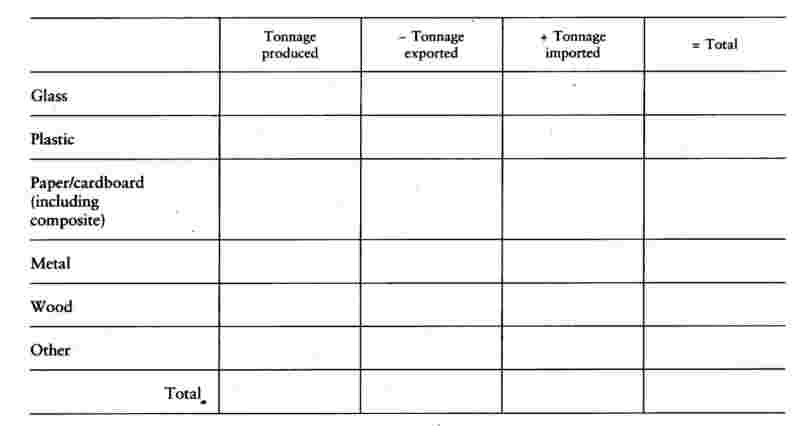 The Commission, in accordance with the procedure referred to in Article 21, shall determine the technical measures necessary to deal with any difficulties encountered in applying the provisions of this Directive in particular to inert packaging materials, put on the market in very small quantities (i.e. approximately 0,1 % by weight) in the European Union, primary packaging for medical devices and pharmaceutical products, small packaging and luxury packaging. 2. Where reference is made to this paragraph, Articles 5 and 7 of Decision 1999/468/EC ( 15 ) shall apply, having regard to the provisions of Article 8 thereof. 1. Member States shall bring into force the laws, regulations and administrative provisions necessary to comply with this Directive before 30 June 1996. They shall immediately inform the Commission thereof. 3a. Provided that the objectives set out in Article 6 are achieved, Member States may transpose the provisions of Article 7 by means of agreements between the competent authorities and the economic sectors concerned. (f) in the event of non-compliance with the agreement, Member States shall implement the relevant provisions of this Directive by legislative, regulatory or administrative measures. Device for measuring dosage which forms part of the container closure for detergents. — Packaging shall be so manufactured that the packaging volume and weight be limited to the minimum adequate amount to maintain the necessary level of safety, hygiene and acceptance for the packed product and for the consumer. — Packaging shall be designed, produced and commercialized in such a way as to permit its reuse or recovery, including recycling, and to minimize its impact on the environment when packaging waste or residues from packaging waste management operations are disposed of. — Packaging shall be so manufactured that the presence of noxious and other hazardous substances and materials as constituents of the packaging material or of any of the packaging components is minimized with regard to their presence in emissions, ash or leachate when packaging or residues from management operations or packaging waste are incinerated or landfilled. — fulfil the requirements specific to recoverable packaging when the packaging is no longer reused and thus becomes waste. Packaging must be manufactured in such a way as to enable the recycling of a certain percentage by weight of the materials used into the manufacture of marketable products, in compliance with current standards in the Community. The establishment of this percentage may vary, depending on the type of material of which the packaging is composed. Packaging waste processed for the purpose of energy recovery shall have a minimum inferior calorific value to allow optimization of energy recovery. ( 1 ) OJ No C 263, 12. 10. 1992, p. 1 and OJ No C 285, 21. 10. 1993, p. 1. ( 2 ) OJ No C 129, 10. 5. 1993, p. 18. ( 3 ) Opinion of the European Parliament of 23 June 1993 (OJ No C 194, 19. 7. 1993, p. 177), common position of the Council of 4 March 1994 (OJ No C 137, 19. 5. 1994, p. 65) and Decision of the European Parliament of 4 May 1994 (OJ No C 205, 25. 7. 1994, p. 163). Confirmed on 2 December 1993 (OJ No C 342, 20. 12. 1993, p. 15). Joint text of the Conciliation Committee of 8 November 1994. ( 4 ) OJ No L 176, 6. 7. 1985, p. 18. Directive as amended by Directive 91/629/EEC (OJ No L 377, 31. 12. 1991, p. 48). ( 5 ) OJ No C 122, 18. 5. 1990, p. 2. ( 6 ) OJ No L 194, 25. 7. 1975, p. 39. Directive as last amended by Directive 91/156/EEC (OJ No L 78, 26. 3. 1991, p. 32). ( 7 ) OJ No L 109, 26. 4. 1983, p. 8. Directive as last amended by Directive 92/400/EEC (OJ No L 221, 6. 8. 1992, p. 55). ( 8 ) OJ No L 377, 31. 12. 1991, p. 20. ( 9 ) OJ L 30, 6.2.1993, p. 1. Regulation as last amended by Commission Regulation (EC) No 2557/2001 (OJ L 349, 31.12.2001, p. 1). ( 10 ) OJ L 166, 1.7.1999, p. 6. Regulation as last amended by Commission Regulation (EC) No 2118/2003 (OJ L 318, 3.12.2003, p. 5). ( 11 ) OJ L 185, 17.7.1999, p. 1. Regulation as last amended by Regulation (EC) No 2118/2003. ( 12 ) OJ L 50, 20.2.1997, p. 28. ( 13 ) OJ No L 326, 29. 12. 1969, p. 36. ( 14 ) OJ No L 377, 31. 12. 1991, p. 48. ( 15 ) OJ L 184, 17.7.1999, p. 23.